Above is a picture of a bed room in the 'Icehotel' in Jukkasjärvi, Sweden. Ice hotels are hotels made up entirely of snow and carved blocks of ice. Such hotels/resorts are created every winter in many countries including, but not limited to, Canada, Finland, Norway, Romania and Sweden. The hotels of ice are reconstructed every year and are dependent upon constant sub-zero temperatures during construction and operation. With arrival of spring and onset of summer the hotels just melt away to be rebuild in the next winter. The World’s first ice hotel aptly named as 'Icehotel' was created in 1989 in the village of Jukkasjärv, Sweden. Since then every year around March, 'Icehotel' stores tons of ice from the frozen Torne River and uses it for re-construction of a fresh building usually in mid-November. When completed, the hotel features a bar, church, main hall, reception area and rooms and suites for over 100 guests to sit and sleep on blocks of sculpted ice in the form of chairs and beds. 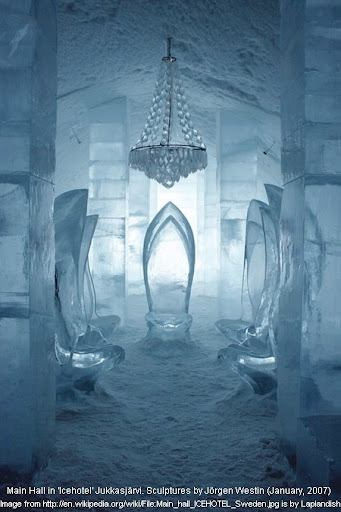 The fixtures, fittings and decorations are all made entirely of ice. The Icehotel in Jukkasjärvi is reportedly the biggest of all ice hotels. With arrival of summer everything melts away.